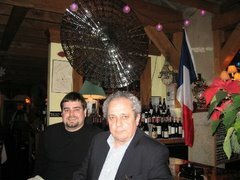 Good French wines under 12 dollars in Chicago? Part 2: Rosé wines. Perfect companions to summer meals and picnics. They should be taken seriously. Last week we had our first real spring week-end with lots of sunshine and temperatures in the upper seventies. It was a perfect time to practice for summer food preparation, get some good charcuterie, roasted red peppers marinated in olive oil and garlic, broil a couple of lamb shops seasoned with thyme, and serve them with some couscous and a touch of harissa, my favorite Tunisian hot pepper condiment. And what should we drink with all these sunny Mediterranean delights? A good rosé wine from either Provence, Languedoc, or the Southwest, of course... But first, before giving you a list of a few interesting rosés under 12 dollars, I need to debunk 2 false ideas about rosé wines. 1. Rosé wines are mediocre wines for non-serious oenophiles? This perception is totally wrong. I remember that until the sixties and even early seventies in Paris and Northern France, rosé wines were considered by many people as poorly made cheap stuff that uneducated tourists would drink in small restaurants in Southern France during their summer vacation. And it is true that in those days you could easily get a nasty headache after drinking some cheap and hastily vinified rosés from Provence sold in low-class restaurants. After all, even in those days, it was not that easy and certainly not cheap to locate a great bottle of Bandol rosé from Domaines OTT or Domaine TEMPIER. Besides, relatively few wine drinkers from the North knew about these two great wine growers. And you would not get the slightest symptom of an upcoming migraine while enjoying these beautiful salmon-colored nectars. One of my most enjoyable wine-drinking memories is a luncheon in the garden of Olivier Ott at his house near Antibes, on the French Riviera, trying his best rosés during the course of the meal. And Stéphane, when your mother and I used to have leisurely-paced lunches at the outside terrace of Le Cintra restaurant, in Aix-en-Provence during the summer of 1962, we had fallen in love with 2 lovely locally produced rosés: The Château La Coste ‘’Rosé d’une nuit’’, a very fragrant Côteaux d’Aix AOC, and the rare and marvelous Château Simone, from the nearby microscopic Palette AOC. Believe me, these wines were extremely well made and as enjoyable as a well-known Bordeaux. In fact, since that time, the serious French producers of rosés have considerably improved their vinification processes and some of these rosés, that can be the result of an expert assembly of 3 or more ‘’cépages’’ (grapes), can reach levels of complexity and structure found, until recently, only in good reds. When we moved to Chicago from Paris, in January 1970, I had a hard time finding any decent rosé in restaurants as well as in wine shops. For most Chicagoans, rosé spelled Mateus, an atrocious Portuguese product, or perhaps Rosé d’Anjou, from the Loire Valley, that most of the time was almost too sweet to be drunk with food. It took me 3 years to find a good Côteaux d’Aix rosé, the Château de Fonscolombes, a wine that unfortunately entirely disappeared from the shelves of Chicago wine retail stores. Nowadays rosés are back in favor in France and have become increasingly popular in the U.S over the last two years. In Chicago it is almost trendy to offer rosé as an apéritif (before dinner drink) and to order it in restaurants during the summer. And I am sure that in California, where some very decent rosés are now produced by serious winemakers specializing in Rhône or Provence-styled wines like Bonny Doon or Preston, rosés are the perfect companion to barbecues. I visited SAM’S wines, the largest wine retailer in the Chicago area, last week and was surprised by the very large amount of French rosé wines that were promoted there. I counted no less than 6 rosés from the sole Costières de Nimes and Vins de pays du Gard areas (Mourgues du Grès, Chateau Guiot, Mas Carlot, Domaine de Gournier, Mas des Bressades, Chateau Grande Cassagne). I also found rosés from Bergerac, Bordeaux, Gascogne, Minervois, Côtes du Rhône, Bandol,Baux-de –Provence. But surprisingly enough not a single Côteaux d’Aix en Provence or even Côtes de Provence. 2. Rosés are made from a mix of red and white grapes or wines. Wrong again... 95% of the time. Rosé (meaning ‘’pink’’) wines are made almost exclusively from red grapes. Their color, whose intensity can vary greatly from a very pale or slightly greyish pink to a slightly orangy salmon, and even to darker almost cherry-hued tones, is directly connected to the type of grape(s) used and above all to the duration of direct contact between the skin and the juice of the grape during the very early stages of maceration in a tank, once the grapes have been crushed after being destemmed, just after harvesting. The maceration period can last a couple of hours, a whole night (like in the case of so called ‘’rosé d’une nuit’’ wines), or a few days, up to two weeks. Some winemakers, in the Côtes de Provence area for example, prefer a very pale pink wine and use the ‘’saignée’’ (bleeding) method that consists in transferring some of the pink juice out of the maceration tank into another fermentation tank after a very short period, separating it from its grape skins. It is then vinified like a white wine. In other cases the cellar master leaves the grape skins separate from the juice and rise up at the top of the tank where they coalesce in what is called the ‘’cap’’. To obtain a darker pink color, this cap is plunged a few times again in the juice. That juice will then be drained (or bled) through a valve at the bottom of the tank and fermented either in barrels or in another tank. The rest of the juice will stay and ferment in the original tank to become red wine. The wine maker will check the color of the juice several times until it reaches the hue he wants to obtain. Some of the best rosés are produced through this ‘’saignée’’ process. But many producers in Provence and in Languedoc do not ‘’bleed’’ and, in order to obtain very delicate pale wines they press the grapes rapidly, after crushing them, in the fermentation tank thus avoiding a regular maceration process involving the skins. The Champagne rosé, on the other hand, is the result of a blend of red and white grapes. And recently some producers of rosés in the South of France have been adding some white grapes to the red ones. Most French rosés are dry, with various levels of fruit. The main grapes used in Provence, where around 50% of the French rosés are produced, are Grenache, Mourvèdre, Syrah, Cinsault and Tibouren. These ‘’cépages’’ are also used in the rosés from the Costières de Nimes, Côteaux du Languedoc, along with some Carignan. But in Bandol Mourvèdre and in a lesser way Cinsault are the main grapes. In the Southern Côtes du Rhône, Côtes du Lubéron, Côtes du Ventoux and Côteaux du Tricastin, you will find many dry but fragrant and slightly spicy rosés made from Grenache, Syrah and Mouvèdre. The Côtes du Lubéron are particularly seductive. On the right bank of the Rhône river, Tavel is one of the most celebrated vineyards of France and the only one that that produce nothing but rosé wines. It has a very floral and fruity bouquet but is dry and is perfect with a stew of rabbit or some pâtés. Farther South, the wine growers of Minervois have considerably improved the quality of their rosés over the last 6 years and you can drink some very flavorful, spicy and strong rosés made from syrah and mourvèdre. If you travel a little farther West and Southwest, several areas produce good rosés, very aromatic and often sold at very attractive prices: Gaillac, Côtes de Saint-Mont, Côtes du Frontonnais, Côtes du Marmandais, Rosés de Béarn. They use a very wide panel of red grapes: Tannat, Cot, Malbec, Cabernet-sauvignon, Merlot, Cabernet franc,Négrette, and even Gamay in a few cases. A little farther North towards Bordeaux, enjoy Bergerac rosé, made from cabernet, merlot and cabernet franc. This wine is a little more complex but it remains easy to drink In the Bordeaux region per se you will find a few rosés, quite dark in color, made essentially from cabernet-sauvignon and/or Melot. Some of them can be very good with salmon or grilled fish. Further north, the Loire Valley offers nowadays some interesting rosés, especially in the Anjou and Touraine areas. The Cabernet d’Anjou is very charming but quite sweet. The Touraine offers some very fruity and fragrant rosés made from gamay grapes that are dryer. To the East, practically at the center of France, in the département of Cher, the Sancerre Rosé, made from Pinot noir, if you are lucky enough to find it and if you can afford it, is one of the most excitingly subtle and fragrant rosés that you will find anywhere. Burgundy produces very few rosés. One exception is the very elegant Rosé de Marsannay made from Pinot noir. But you rarely find it in Chicago. In the Beaujolais and Maconnais areas there are a couple of of wine growers that vinify Gamay grapes in rosé. What to eat with rosé wines? Almost anything but steaks and creamy cheeses made from cow’s milk. A few dishes that go well with rosés: Mediterranean grilled vegetables (red peppers marinated in olive oil and garlic is a good example) Grilled lamb brochettes (skewers) Aioli (boiled cod fish or lamb with cooked vegetables served with a garlic mayonaise) Grilled sausages Grilled and marinated salmon Grilled snapper Calamari Grilled or cold shrimps Brandade Charcuterie such as pâtés, hams, dry salami, rillettes, terrines, etc. Prosciutto and melon Goat cheese Salade niçoise Cold leg of lamb with ratatouille Veal dishes, but not in heavy or creamy sauces Olives Pizza Pasta with olive oil, tomatoes, capers, and garlic Roasted or cold chicken, rabbit, and turkey Greek food (for example: see my recipe of Greek chicken legs on this blog) And generally all Asian, Mexican, and North-African, and Middle-Eastern foods, especially spicy. Rosé wines should be drunk young, 1 to 2 years after bottling, and served chilled (around 45 degrees Farenheit), but never ice-cold. Château Mourgues du Grès. Fleur d’églantine. Costières de Nîmes 2005. Vinfied by saignée this is a seductive blend of syrah, grenache and carignan that is full of cherry, raspberry, and red currant aromas. Very long finish for a rosé. Delicious with exotic foods or grilled fish. 9.99 dollars at Binny’s Château Mourgues du Grès. Les galets rosés. Costières de Nîmes 2006. Same grower. But this one has a a little more syrah that provides body and spice and is fine to drink with a nice barbecued lamb chop or a steak of tuna. 10.99 dollars at Binny’s Domaine de la Petite Cassagne. Costières de Nîmes 2006. Another fine import from Bobby Kacher offering a very good quality-price ratio. This very fragrant rosé is the perfect companion to a good salade niçoise or to a dish of provençal pasta. 7.99 dollars at Binny's Mas des Bressades. Costières de Nîmes. 2006. Another very well vinified, aromatic but complex enough rosé made by the same woman, Nathalie Blanc-Marès, who makes the very pleasant rosé Vin de pays d’Oc Mas Carlot (8.99 dollars at Sam’s). Bressades is great with barbecued chicken, or grilled fish. 9.99 dollars at Sam’s Domaine de Figueirasse. Gris de Gris. Vin de pays des Sables du Golfe de Lion. 2006 This unusual very pale rosé wine is the result of a very short maceration of Grenache gris and Cinsault. It is produced in an area of the Gard practically on the Mediterranean Sea, half way between Sète in the département of Hérault and Les Saintes Maries de la Mer in the beautiful Camargue. A good balance of acidity and fruit (notes of berries and melon) it is very refreshing and should be drunk nicely chilled. Good with grilled snapper or a mixed mediterranean salad. 8.99 dollars at Sam’s. From the Southern Côtes du Rhône Domaine de la Solitude. Côtes du Rhône. 2005. Made in the département du Gard, on the right bank of the Rhône river, this very satisfying blend of syrah, grenache and mourvèdre is made by the Lançon family, that produces under the same label the famous Châteauneuf du Pape. This rosé is rather intense with a good but balance concentration of fruit. Great with lamb and ratatouille. 10.99 dollars at Binny’s. From Provence: Unfortunately, I am sorry to report that I did not find a single rosé from that important area of production under 12 dollars in the Chicago area. From the Beaujolais area: Château des Correaux. Corail Rosé. 2005. This is a very aromatic (notes of black currant) but dry wine made from Gamay noir grapes. Good with frog legs or chicken fricassee. 7.99 dollars at Sam’s Enjoy the summer... and see you in 2 months in my dear département du Gard.